Handy hints for travelling with kids! If you’re heading off on a holiday, we have some tips to help your kids avoid neck, arm or shoulder pain when travelling long distances in the car or plane. So that they arrive at their destination rested and pain free! There is always the temptation to pack more than we actually need, pack lightly! Make sure that your kids backpacks are kept as light as possible. The heavier the backpack, the more likely it is to put strain on your child’s back, neck and arms. We all know that one of the best ways to keep your kids occupied when travelling long distances is for them to watch a movie or play a game on their iPad. 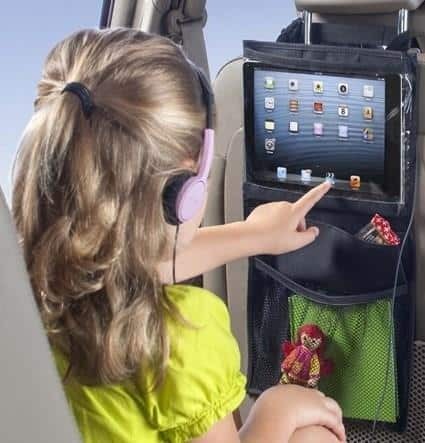 To prevent them getting headaches, neck, arm or shoulder blade pain from leaning over to access their iPads, install an iPad car or plane mount kit. This can be adjusted to suit your child’s posture, it is transportable and can be put on the back of an aeroplane seat. If your child sits in a car seat make sure that it is set up properly supporting their back, neck and arms if they don’t need a car seat make sure that they are supported with cushions or an arm rest. One of the most important things that you can do is to schedule breaks during your trip and get everyone to take the time to stretch! Stretching keeps the blood circulating around the body, relieving any build up of tension. Stopping your muscles from tightening and aching, taking stress off of your spine. To find out more about how our Physio’s can help you after you have been travelling over long distances, you can make an appointment any one of our practices.